St Michael's cemetery in Rivelin was the primordial Catholic burial ground in Sheffield with roughly 20,000 people buried there. It was opened in 1862 shortly after the Vincentian Order came to Solly Street, Sheffield where they had established a church and school. Since this area of Sheffield was known in the middle of the 19th century as 'little Ireland' most of the people interred in St Michael's, at least for the first 50 years of its existence, were of Irish descent. Before the present St Michael's Chapel was opened in 1877 there was an original small chapel on the site. Over the years the present building fell into disrepair but an extensive renovation work to restore it to its former glory, with the help of English Heritage, was completed in 2005. The finished work both, inside and outside, is a fitting testimony to the generosity of the people of St Vincent's who can be justly proud of their accomplishments. St Michael's cemetery at present is soon reaching the stage where it could be termed 'full'. Most burials these days are in existing family plots rather than new graves. Very many people, especially during the Summer months, visit St Michael's, not just from the Sheffield area, but further afield and even internationally. We try and keep the grass down during the Spring and Summer months but you'll have to forgive us if it's not always in as trim and prime condition as it should be. Please note our Mass times for the Chapel are 10.30 am on the first Monday of every month, plus Bank Holidays. All are welcome. I hope you have enjoyed your visit to our website and that you will check back soon. By all means visit our cemetery in person if you are in the area. It emanates an atmosphere of peace and tranquility which befits our dear departed loved ones as they await the Resurrection from the Dead. Whilst walking in the cemetery, please note that some headstones are extremely old and may be unstable and therefore dangerous. Therefore, please try to keep to the paths as far as possible and take extra care. The parish is not able to take responsibility for any third party advice given from this website. LOCATION: St Michael’s Cemetery is a Catholic burial ground in the Rivelin Valley area of Sheffield, South Yorkshire, United Kingdom. The cemetery stands on a steep hillside on the south side of Rivelin Valley Road at its junction with Rivelin Road and Hollins Lane. Please take care when walking in the cemetery. Many areas are uneven with slippery ground. It is advised to keep to the paths and avoid leaning on tomb stones as they may be unstable. For Vehicle Sat-Nav users, the postcode is S6 5GL. For all cemetery enquiries, please email: crookes@catholicweb.com or telephone: 0114 2680716. Or alternatively write to: The secretary, St. Vincent's Catholic Church, 40 Pickmere Road, Crookes, Sheffield S10 1GY, South Yorkshire. Please note: Burial records are available in PDF format and can be downloaded from the Burial Records tab. There are 19,555 records (at April 2016) which can be viewed in Acrobat Reader by order of Surname. The single file contains a total of 388 A4 pages and is 4.3 mb in file size. These records were originally hand written, often in illegible handwriting, and therefore re-typed and transferred to computer over a period of 15 years. Much credit for this painstaking task must be given to the late Vincent Hale, a retired solicitor and former administrator of St. Michael's cemetery. Accordingly, the parish would like to extend its grateful appreciation for all the dedication that Vincent has given to St. Michael's and the parishioners for many years. Sadly, Vincent passed away on 11th November 2014, and is interred in the family grave behind the chapel. R.I.P. It is inevitable that the occasional typing error has occurred. Please inform us of any inaccuracies that you may discover so that records can be updated. A brief history of St. Michael's . . . The burial of Catholics even in the 1860's, still depended on the local authority providing a place in the municipal cemeteries, there being no consecrated ground available where they might bury their own dead. After much searching, Father Burke, found an open plot of eight acres for sale on a sloping hillside of Rivelin Glen. With the help of a non-Catholic friend, he purchased the land which was then walled round, receiving government approval as a burial ground in August 1862. The following month, the cornerstone of the original St Michael's Chapel at Rivelin was laid and consecrated by Bishop Cornthwaite. This ceremony was attended by societies, guilds and confraternities in full regalia and bearing their banners, with drum and pipe band, who had marched from St Vincent's and lined the drive to the site of the new chapel. By the summer of 1863, the entire work on the cemetery and it's chapel had been completed. 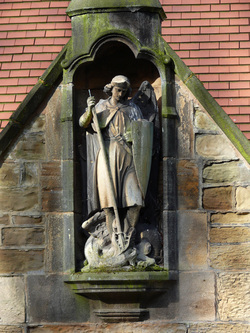 Its purpose was to serve the Catholics of Sheffield until 1878 when the present St. Michael's chapel was built. [For history of the chapel in greater detail, please view the video below or select the full History section tab for reading material]. 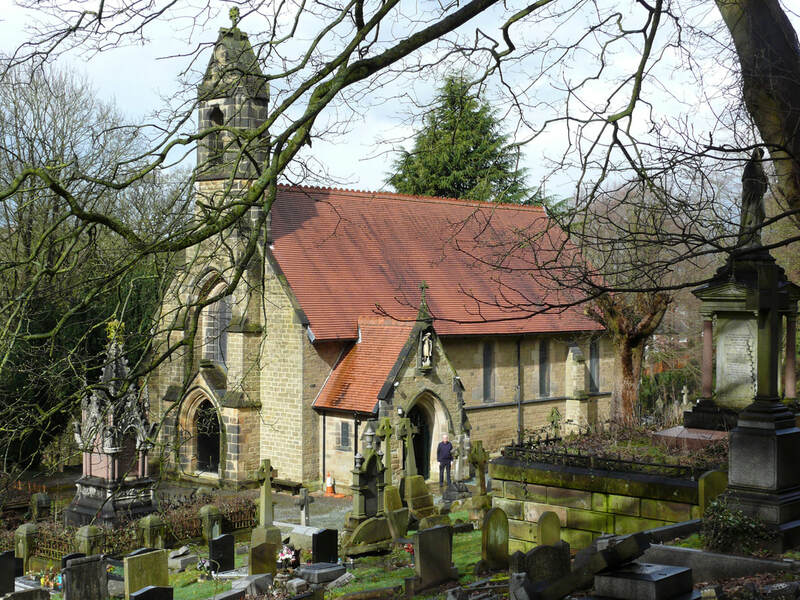 This film takes a detailed look at Saint Michael's Church and cemetery on Rivelin Valley Road in Sheffield. It was filmed in February 2008 after many renovations had taken place. Father Patrick Walsh and prominent local solicitor and parishioner, the late Vincent Hale, are the narrators and guides presenting the highlights of this historic church. The video is HD 720p, 37 minutes long and is free to download. No attribution necessary. St. Michael's R.C. Chapel, February 2011 - MASS TIMES: 10.30 am first Monday of each month plus Bank Holidays. Footnote from administrator: At the end of April 2018 I will be leaving my employment with the diocese (and cemetery). The work has been very enjoyable and I'm grateful for all the interesting work experience gathered during my seven years at the cemetery and chapel. Thank you to all that have made me welcome at St. Michael's, and I wish my successor the best of luck in their endeavours for the future. Martin Fenwick - 27 April 2018.